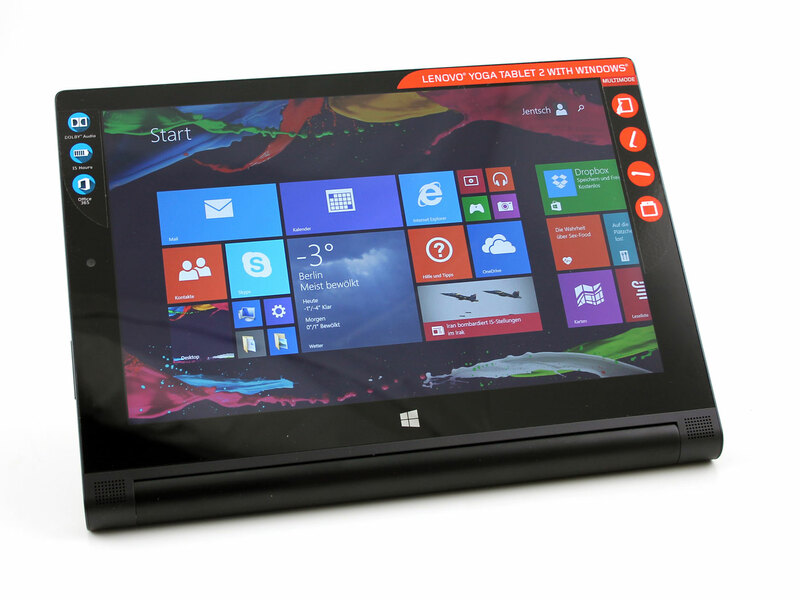 Lenovo Yoga 2 Tablet Windows 8.1: The Windows version comes with a dockable keyboard and HDMI. An all-purpose tablet for productivity and entertainment? 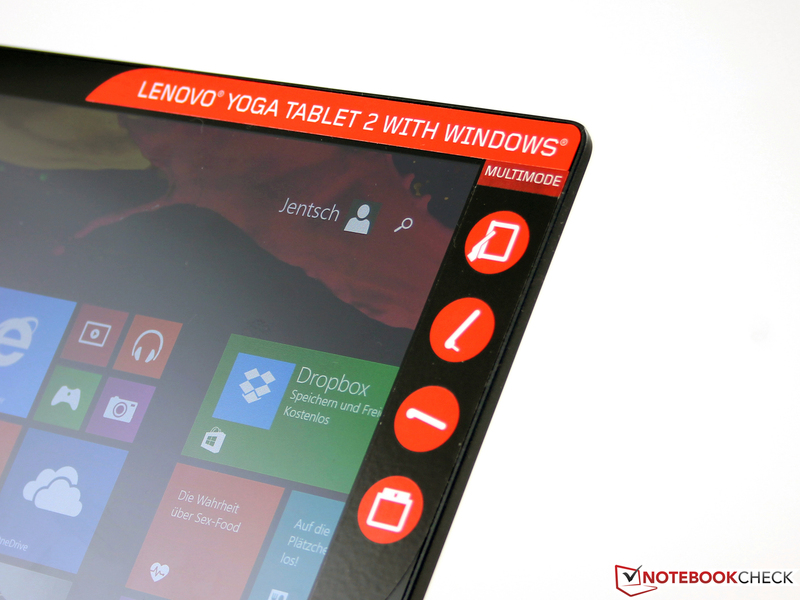 Lenovo didn't tarry much in releasing a Windows version of their 10-inch Lenovo Yoga Tablet 2. We, of course, also reviewed the Android model, the 1050F. The 1051F with Windows 8.1, HDMI, a year-long Office 365 license and 32 GB of internal storage currently costs 399 Euros in stores (~$491). 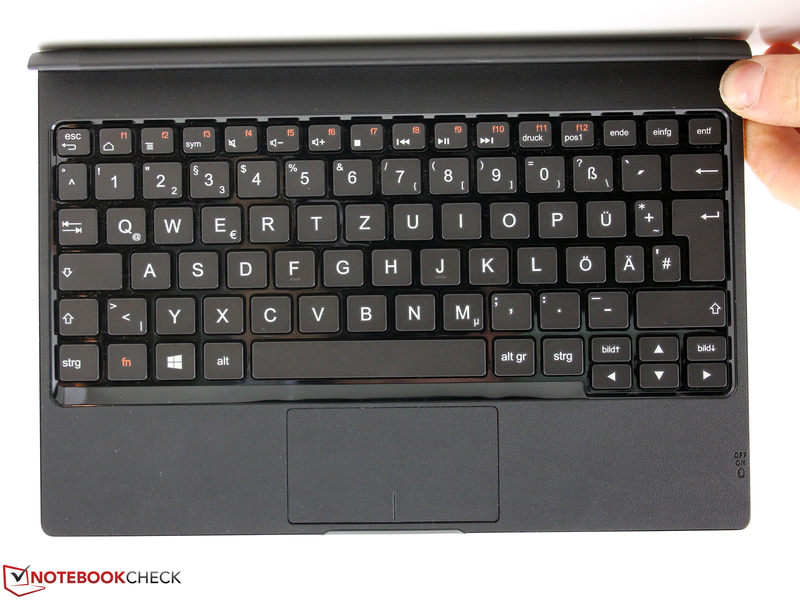 That's 100 Euros (~$123) more than the Android model, but a dockable Bluetooth keyboard comes with the Windows device. In this short update, we'll concentrate on the differences between the 1050F (Android) and the 1051F (Windows). We won't cover topics like the display, connectivity, manufacturing quality or speaker in this review -- information on those subjects is available in our review of the 1050F. Instead, we'll take a closer look at the tablet's Windows performance, including how the performance compares across platforms. We also wondered: How long is the battery life? Does the machine generate more heat and consume more energy running Windows? Our short update reveals the answers to these questions and more. This Lenovo device comes hot on the heels of two of its 10-inch rivals: The HP Omni 10 5600eg (399 Euros; ~$491) and the Aspire Switch 10 SW5-012-13DP (400 Euros; ~$492). Both these devices have IPS panels with a resolution of 1920x1200 pixels. Of the two, only the Switch 10 comes with a keyboard for this price; a keyboard for the Omni 10 costs extra. The case that holds our little portal into the Windows world is no longer silver, but black. The materials, however, are identical: Aluminum for the frame, and rubberized plastic for the easy-to-grip back side. One important detail has changed, however: The 1051F is outfitted with a Micro HDMI port, where before there was simply empty space (right side). The keyboard docks to the tablet magnetically -- there are no electric contacts here. The keyboard unit communicates with the computer via Bluetooth and has its own internal battery. The battery has to be charged with a Micro B cable (included) connected to a PC or power supply (type A). The power supply has an output for type A, which is how the keyboard can be charged through the shorter "power cord." On the dock, the tablet can shift a little to the left or the right, but it can't shift forward or backward. The Yoga's kickstand has to be folded back to hold the tablet upright if you want to work at a table or desk. Using the keyboard-tablet combination like a laptop in your lap doesn't really work -- the stand isn't secure on your legs and the tablet tends to fall backwards. True docking tablets are better in such circumstances. With their palpable travel and clear markings, the keys are good enough to make writing on the tablet doable. However, it won't be a great experience: Keystrokes feel too soft and bouncy. The keyboard in itself has a pretty solid feel, partly because its underside is made of aluminum. The top side is covered with slip-resistant imitation leather. 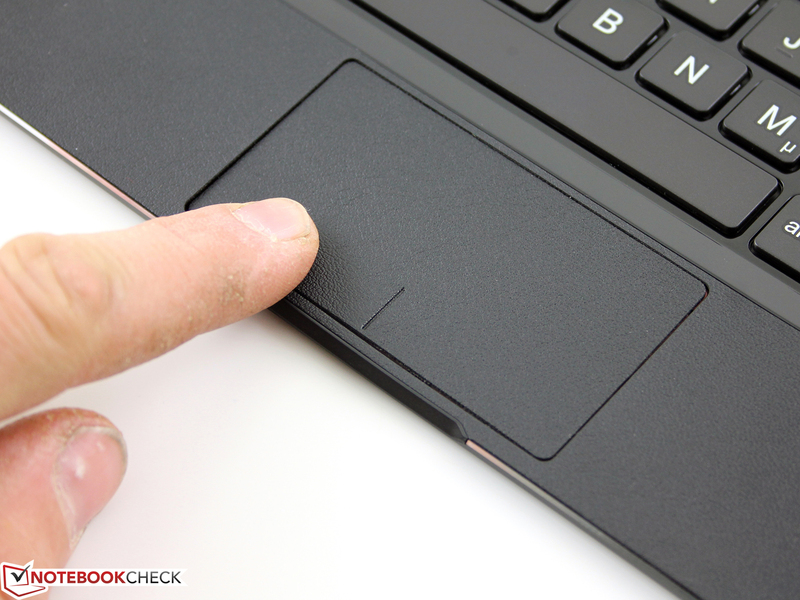 This “leather” also extends into the ClickPad, which accounts for its uncomfortable and dull surface. 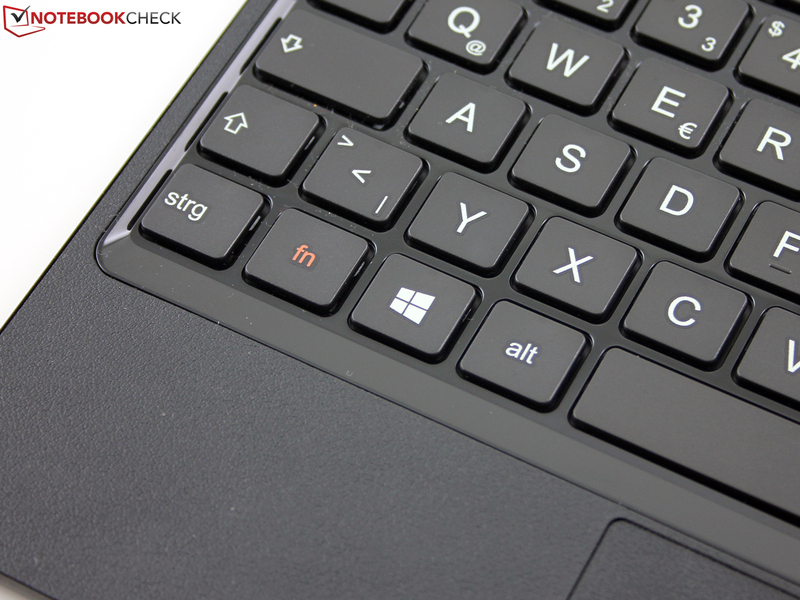 The little pad's mouse replacement keys, however, are endowed with a clear travel length and distinct click point. The ClickPad has one other obvious drawback: The click is much too loud, which would make working in a library or at a silent auction rather uncomfortable. As was true of the 1050F, Lenovo installed a 10.1-inch panel with a resolution of 1920x1200 pixels in their Windows tablet. The two panels' brightness, contrast, color reproduction and viewing-angle stability are very similar, which leads us to conclude that the manufacturer probably used identical models. The display type is not recorded anywhere. The limitations of measuring accuracy can easily account for the small differences between the two panels. Our attempt to calibrate the display failed, so, unfortunately, we're unable to offer an ICC profile here. 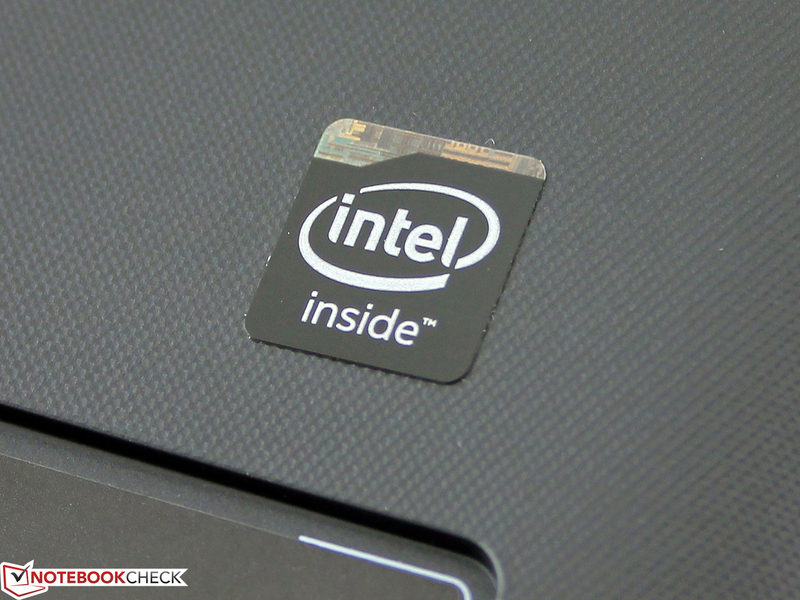 The Intel Atom Z3735F (1.33 GHz) is part of the family of Bay Trail-T SoCs and is optimized for tablets. 2 GB of LPDDR3 RAM serve as the onboard memory. 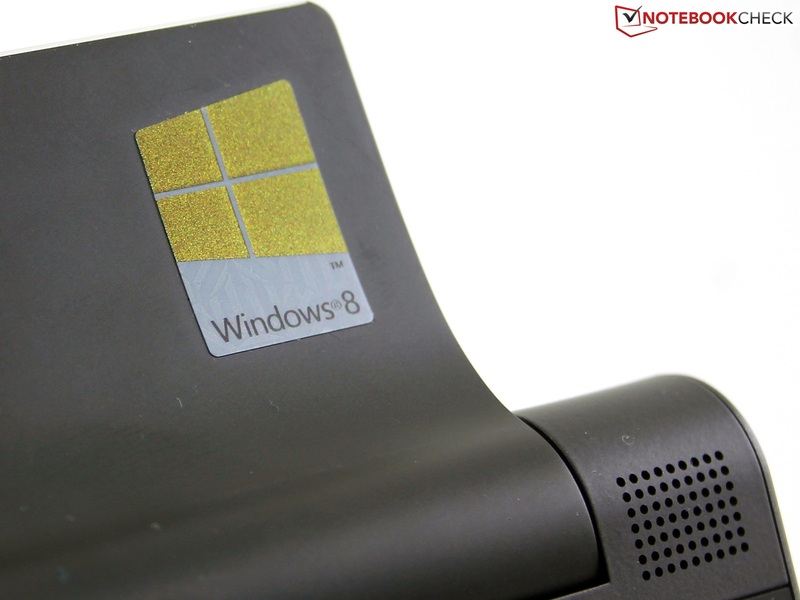 Lenovo installed the 32-bit version of Windows 8.1 as the tablet's operating system, and subtracting the 6 GB recovery partition, 17 GB of storage space remains available to the user. Data saves to a 32 GB eMMC flash storage medium. Let's first take a look at the Cinebench R10 results from the Windows world. The Atom Z3735F can't keep up with the Omni 10 (Atom Z3770; 1.46 GHz), which has to do with the latter processor's higher clock rate. The same goes for our tablet compared to the Transformer Book T200TA. 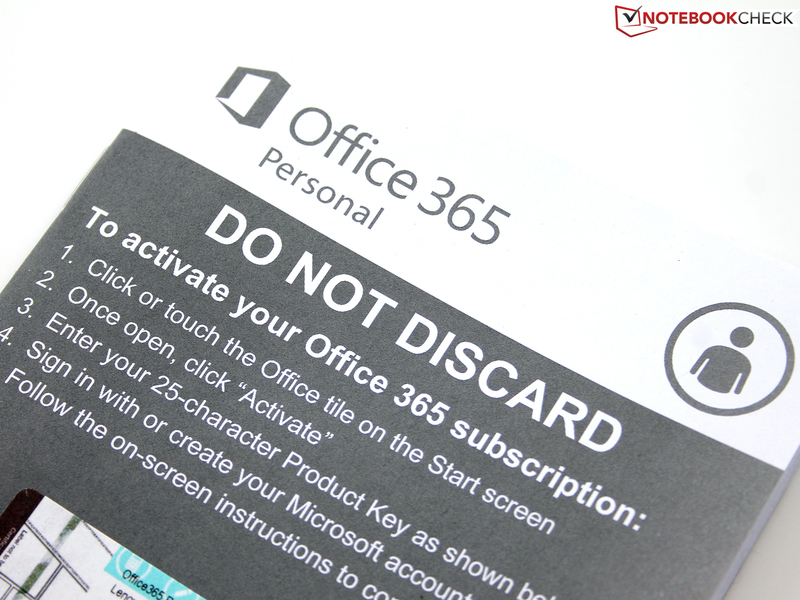 Our device does, however, outshine the Aspire Switch 10, which is also equipped with an Atom Z3735F. The Wortmann Terra Pad 1060's dual-core Celeron can't hold a candle to the rest of the competition. 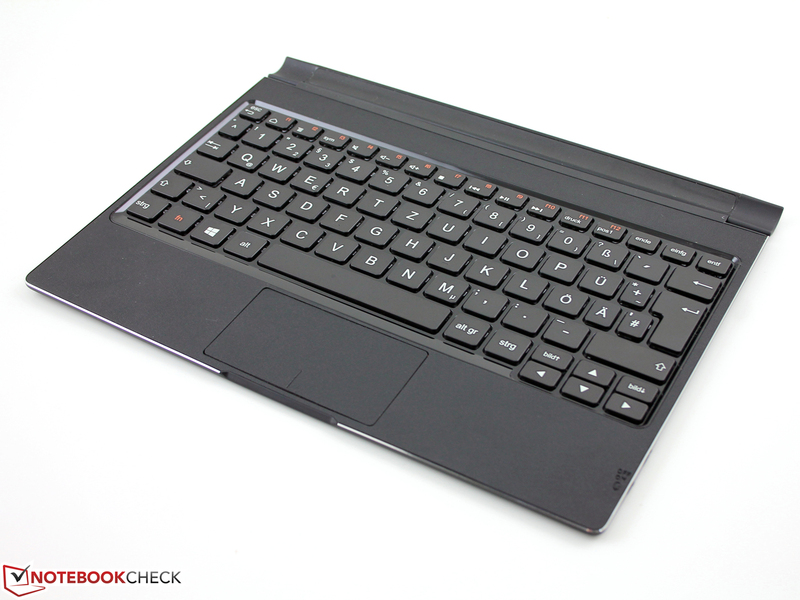 The Yoga 2 1051F fully utilized its turbo in this test (1.86 GHz). The browser benchmarks enable us to compare our Windows tablet's performance with systems running Android and Chrome OS. In Google V8 version 7, our test device's sister model (the 1050F) scored 90% higher, even though it's outfitted with the same SoC. SunSpider and Octane 2.0 paint a similar picture. It seems, then, that Android's better browser performance is responsible for this disparity. Our tablet's application performance scores come in somewhat beneath those obtained by its rivals in one benchmark (PCMark 8), but its scores prove to be on par with or even somewhat ahead of those same competitors in another benchmark (PCMark 7). The Celeron models come in last here. Our test device's system storage score in PCMark 7 is quite good, which is explained by the relatively high throughput recorded by CrystalDiskMark. Still, none of these results come anywhere near those achieved by a real SSD. As previously stated, CrystalDiskMark shows slightly higher data throughput rates compared to the competition -- though these rates can only be higher because these devices are all equipped with similar low-cost eMMCs. Real SSD storage media generally achieve results like 500 MB/s in the sequential read test and up to 35 MB/s in the read 4K test, for example. It's possible to do much worse here (Satellite Radius -60%), but it's also possible to do substantially better (Wortmann Terra Pad +154%), as the table below shows. The Intel HD Graphics card at work in our test device clocks at between 578 and 779 MHz. The card's slow performance lies exactly on par with that of all the other Bay Trail Atom iGPUs. The system's gaming performance is only strong enough to fluidly render browser-based games or very old PC games. The newest generation of games, or even last year's games, is simply out of the question. In our tests, the Lenovo tablet's surfaces remained cool until the device was under load -- at which point one hotspot hit a whopping 52 °C (125.6 °F). The Android-based sister model, the 1050F, didn't reach temperatures nearly that high. The other Windows-based competitors heat up to similar temperatures under load. None of them possess active fans and are instead passively cooled. 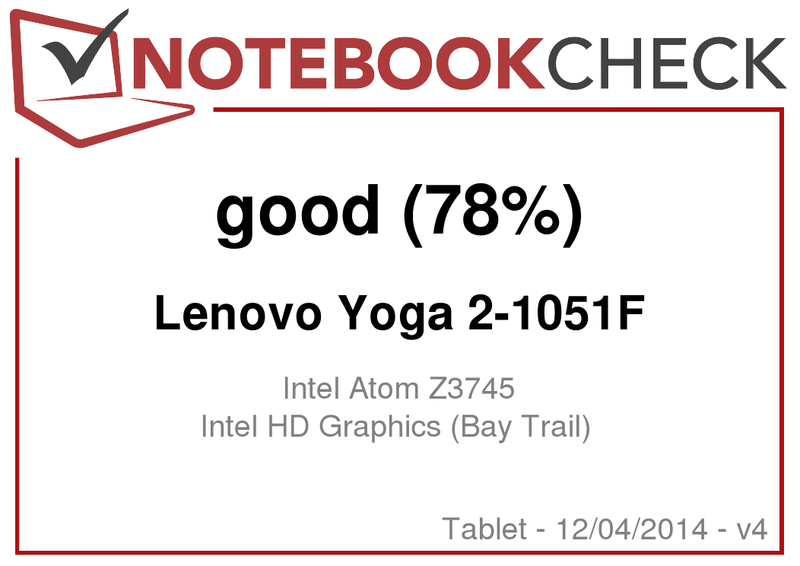 The Yoga 2 1051F completed the stress test at a constant 1.86 GHz -- the same speed it ran at under simple load. The SoC's maximum temperature measured 60 °C (140 °F). (±) The average temperature for the upper side under maximal load is 34.1 °C / 93 F, compared to the average of 30.7 °C / 87 F for the devices in the class Tablet. Our tablet's energy consumption rates prove to be just a little higher than those of the 1051F Android version. In idle mode, however, the 1051F's system read a minimum energy usage rate of 1.3 Watts -- just like the rest of the competition. Still, the fact that all these devices use so little energy in idle mode is very impressive and shouldn't be discounted. This low number accounts for the tablet's long maximum battery life of 23:40 hours. We were displeased, however, with the machine's load cycle: While the tablet was plugged into a power outlet and the PCMark 8 benchmark ran for several hours, the completely empty battery only regained a few percent of its charge. The battery charged at similarly slow rates while we ran other programs and benchmarks. The culprit here must be the undersized power supply (10 Watts, 5 Volts): The system's energy consumption rate under load exceeds the power supply's wattage. In idle mode (medium brightness), the battery needed a good 6:30 hours to charge. Additionally, even if the connector fits, the tablet can't be charged through a USB 3.0 port on a PC or laptop. 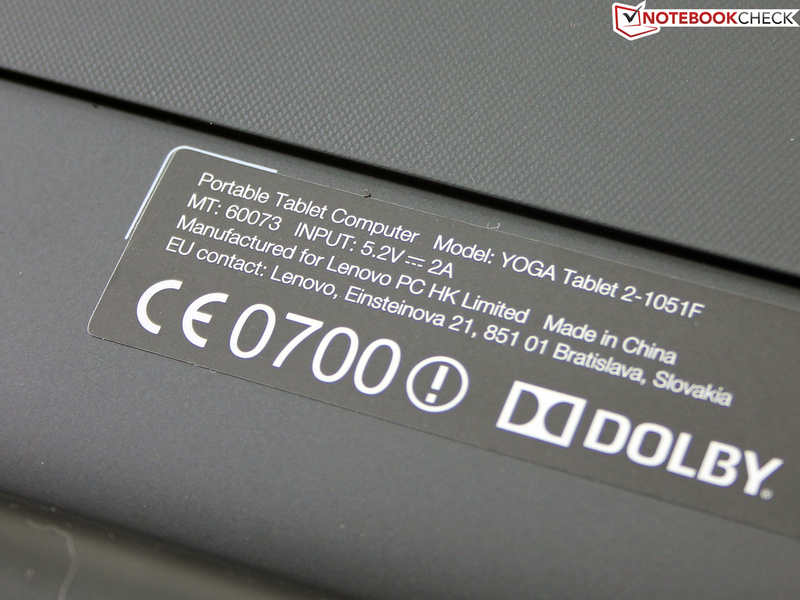 Battery life is one of the Yoga 2 1051F's strengths. The tablet even surpasses its sister model, the 1050F, by a little in idle mode and by a lot in our more practical WLAN test (23%). Other competitors, like the HP Omni 10 5600eg, can't keep up with our test device's nearly 24 hours in idle mode and 15 hours in the WLAN test. Lenovo outfitted the tablet with a 34-Watt battery. Together with the system's low energy consumption rate in idle mode this generously-sized battery enables the device to reach such long battery runtimes. 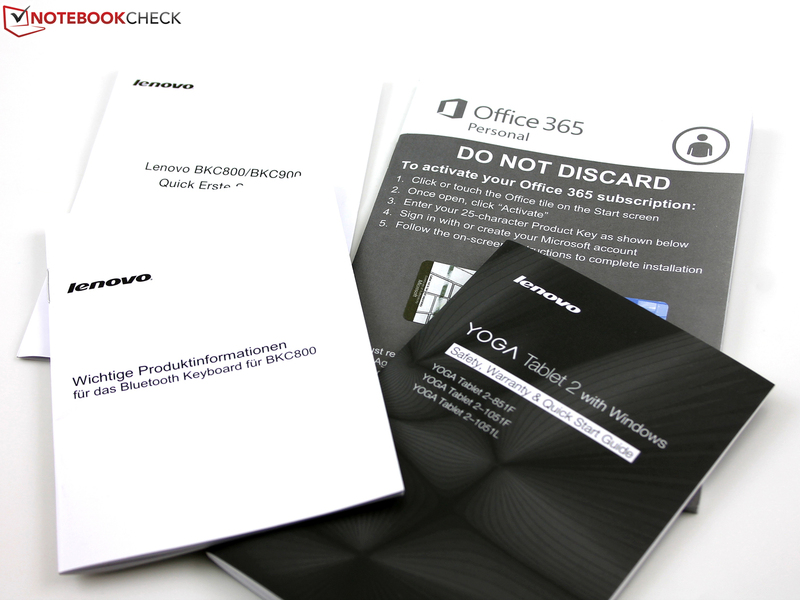 Lenovo carried over the positive characteristics of their Yoga Tablet 2 1050F into the Windows world. A high-quality case goes hand in hand with a first-class IPS panel. The Bay Trail Atom processor hails from the lowest performance class, but with the system's relatively fast eMMC, somewhat larger storage space (32 GB instead of 16 GB; 17 GB available to the user), and additional HDMI port, running Windows applications that don't demand too much in the way of performance is still an enjoyable experience. The tablet's high temperatures under load are by no means a reason for us to cross the Yoga Tablet 2 1051F off our list, as very few users will be regularly running applications that push the system so hard. The Windows tablet's battery life is just as good as its Android counterpart's -- both devices can boast of fantastic endurance. 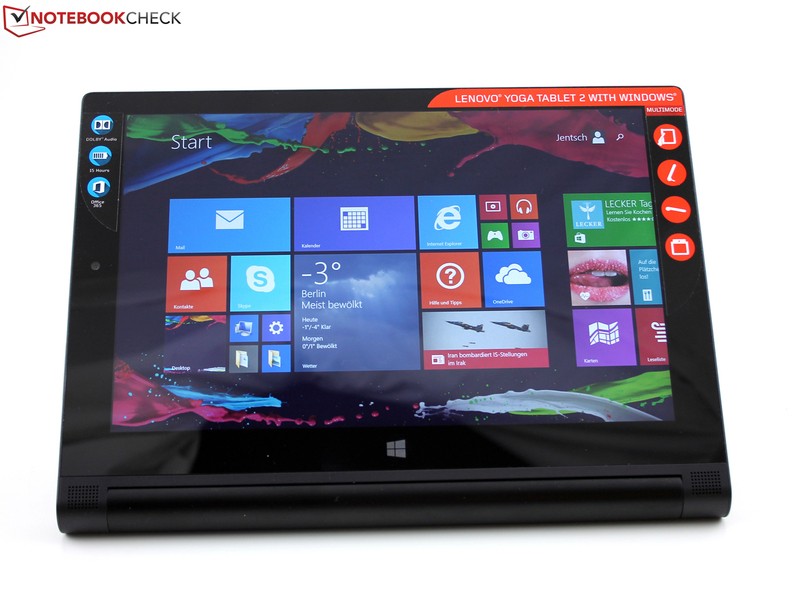 The Lenovo Yoga 2 tablet is available with Windows 8.1. ...and an HDMI port, the Android and Windows versions are identical. In terms of price, the Windows model costs 100 Euros more than the Android version (300 Euros vs. 399 Euros, ~$370 vs. ~$491). The LTE version (which was not our test model) costs 449 Euros (~$553). 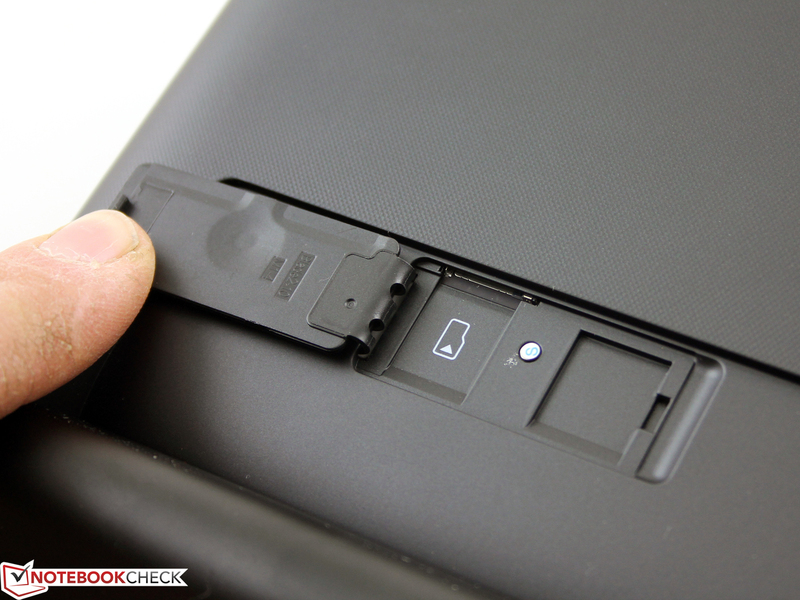 This photo shows the SIM-card slot. The strong battery life, the high-quality aluminum case and the decent camera. A mechanical keyboard with a hard stroke-feel and tapered keys. The keyboard could be a good centimeter high to allow for that. That the battery life is just as good as the Android model's. No room to diss Windows here.